Thanksgiving comes just once a year, so why not splurge with that extra piece of pie or another helping of stuffing? The truth is, many of us pack on extra pounds that don’t go away after the holidays. And the older you get, the harder it is to lose the weight, experts say. Get active and burn off extra calories before you ever indulge in your favorite foods. Experts suggest that you lengthen your fitness routine ahead of Thanksgiving Day. Also involve the entire family by taking a walk on Thanksgiving morning and then again after dinner. Instead of saving up calories for the big meal, eat a small meal in the morning so you have more control over your appetite. 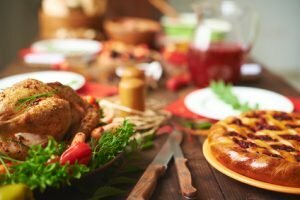 – Use chicken broth to baste the turkey and make gravy. – Use fruit purees instead of oil in baked goods. – Reduce oil and butter wherever you can. – Try to include a variety of your favorites on one plate, and save room for dessert. That will make the leftovers even more exciting the next day.